"Norseman" and "Northmen" redirect here. For other uses, see Norseman (disambiguation) and Northmen (disambiguation). In English-language scholarship since the nineteenth century, the Viking Age Norsemen, seafaring traders, settlers and warriors have commonly been referred to as Vikings. The Norse Scandinavians established polities and settlements in what are now England, Scotland, Iceland, Wales, the Faroe Islands, Ireland, Russia, Belarus, Greenland, France, Belgium, Ukraine, Finland, Estonia, Latvia, Lithuania, Germany, Poland and Canada as well as Sicily. The word Norseman first appears in English in the early nineteenth century: the earliest attestation given in the third edition of the Oxford English Dictionary is from Walter Scott's 1817 Harold the Dauntless. The word was coined using the adjective norse, which was borrowed into English from Dutch in the 16th century with the sense 'Norwegian', and which by Scott's time had acquired the sense "of or relating to Scandinavia or its language, esp[ecially] in ancient or medieval times". Like the modern use of the word viking, therefore, the word norseman has no particular basis in medieval usage. The term Norseman does, however, echo terms meaning 'Northman' applied to Norse-speakers by the peoples they encountered during the Middle Ages. The Old Frankish word Nortmann ("Northman") was Latinised as Normannus and was widely used in Latin texts. The Latin word Normannus then entered Old French as Normands. From this word came the name of the Normans and of Normandy, which was settled by Norsemen in the tenth century. The same word entered Hispanic languages and local varieties of Latin with forms beginning not only in n-, but in l-, such as lordomanni (apparently reflecting nasal dissimilation in local Romance languages). This form may in turn have been borrowed into Arabic: the prominent early Arabic source al-Mas‘ūdī identified the 844 raiders on Seville not only as Rūs but also al-lawdh’āna. In modern scholarship, Vikings is a common term for attacking Norsemen, especially in connection with raids and monastic plundering by Norsemen in the British Isles, but it was not used in this sense at the time. In Old Norse and Old English, the word simply meant 'pirate'. The Norse were also known as Ascomanni, ashmen, by the Germans, Lochlanach (Norse) by the Gaels and Dene (Danes) by the Anglo-Saxons. The Gaelic terms Finn-Gall (Norwegian Viking or Norwegian), Dubh-Gall (Danish Viking or Danish) and Gall Goidel (foreign Gaelic) were used for the people of Norse descent in Ireland and Scotland, who assimilated into the Gaelic culture. Dubliners called them Ostmen, or East-people, and the name Oxmanstown (an area in central Dublin; the name is still current) comes from one of their settlements; they were also known as Lochlannaigh, or Lake-people. In the 8th century the inrush of the Vikings in force began to be felt all over Pictland. These Vikings were pagans and savages of the most unrestrained and pitiless type. They were composed of Finn-Gall or Norwegians, and of Dubh-Gall or Danes. The latter were a mixed breed, with a Hunnish strain in them. However, British conceptions of the Vikings' origins were not quite correct. Those who plundered Britain lived in what is today Denmark, Scania, the western coast of Sweden and Norway (up to almost the 70th parallel) and along the Swedish Baltic coast up to around the 60th latitude and Lake Mälaren. 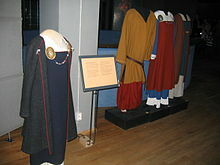 They also came from the island of Gotland, Sweden. The border between the Norsemen and more southerly Germanic tribes, the Danevirke, today is located about 50 kilometres (31 mi) south of the Danish–German border. The southernmost living Vikings lived no further north than Newcastle upon Tyne, and travelled to Britain more from the east than from the north. The northern part of the Scandinavian Peninsula (with the exception of the Norwegian coast) was almost unpopulated by the Norse, because this ecology was inhabited by the Sami, the native people of northern Sweden and large areas of Norway, Finland, and the Kola Peninsula in today's Russia. The Slavs, the Arabs and the Byzantines knew them as the Rus' or Rhōs (Ῥῶς), probably derived from various uses of rōþs-, i.e. "related to rowing", or from the area of Roslagen in east-central Sweden, where most of the Vikings who visited the Slavic lands originated. Archaeologists and historians of today believe that these Scandinavian settlements in the Slavic lands formed the names of the countries of Russia and Belarus. The Slavs and the Byzantines also called them Varangians (Old Norse: Væringjar, meaning "sworn men"), and the Scandinavian bodyguards of the Byzantine emperors were known as the Varangian Guard. In the Old Norse language, the term norrœnir menn (northern people), was used correspondingly to the modern English name Norsemen, referring to Swedes, Danes, Norwegians, Faroe Islanders, Icelanders, etc. The modern Scandinavian languages have a common word for Norsemen: the word nordbo, (Swedish: nordborna, Danish: nordboerne, Norwegian: nordboerne or nordbuane in the definite plural) is used for both ancient and modern people living in the Nordic countries and speaking one of the Scandinavian Germanic languages. The word Vikings: Vikinger in Danish and Norwegian Bokmål, and Vikingar in Swedish and Norwegian Nynorsk is not used as a word for Norsemen by natives, as "Viking" is the name for a specific activity/occupation (a "raid"), and not a demographic group. The Vikings were simply people (of any ethnicity, or origin) partaking in the raid (known as "going viking"). On occasions Finland is also mentioned as a "Scandinavian country". The Finnish language is not Germanic or even Indo-European, but Finland was for around six centuries a part of Sweden (late 12th century to 1809), and around 6% of the Finnish population still use Swedish as their first language. In the Åland islands Swedish is by far the dominant language, because the population there are ethnic Swedes but belonging administratively to Finland since 1809. Elsewhere in Finland the share of Swedish-speaking people has been dropping ever since Finland gained independence in 1917, after the Russian Revolution. Iceland, Greenland, and the Faroe Islands are also geographically separate from the Scandinavian peninsula. The term Nordic countries is therefore used to encompass the Scandinavian countries, Iceland, Greenland, the Faroes and Finland. ^ Linden, Eugene (December 2004). "The Vikings: A Memorable Visit to America". Smithsonian Magazine. ^ "Norseman, n.", "Norse, n. and adj." OED Online, Oxford University Press, July 2018, https://www.oed.com/view/Entry/128316, https://www.oed.com/view/Entry/128312. Accessed 10 September 2018. ^ "Viking, n." OED Online, Oxford University Press, July 2018, http://www.oed.com/view/Entry/223373. Accessed 10 September 2018. ^ "Northman, n." OED Online, Oxford University Press, July 2018, https://www.oed.com/view/Entry/128371. Accessed 10 September 2018. ^ Louis John Paetow, A Guide to the Study of Medieval History for Students, Teachers, and Libraries, Berkeley: University of California, 1917, OCLC 185267056, p. 150, citing Léopold Delisle, Littérature latine et histoire du moyen âge, Paris: Leroux, 1890, OCLC 490034651, p. 17. ^ Ann Christys, Vikings in the South (London: Bloomsbury, 2015), pp. 15-17. ^ Ann Christys, Vikings in the South (London: Bloomsbury, 2015), pp. 23-24. ^ "Viking, n.". Oxford English Dictionary. Oxford University Press. July 2018. Retrieved 10 September 2018. ^ Cleasby, Richard; Vigfusson, Gudbrand (1957). "víkingr". An Icelandic–English Dictionary (2nd edition by William A. Craigie ed.). Oxford University Press. ^ Bosworth, Joseph; Northcote Toller, T. (1898). "wícing". An Anglo-Saxon Dictionary. Oxford University Press. ^ Adam of Bremen 2.29. ^ Richards, Julian D. (8 September 2005). Vikings : A Very Short Introduction. Oxford University Press. pp. 15–16. ISBN 9780191517396. Retrieved 7 February 2018. ^ Baldour, John Alexander; Mackenzie, William Mackay (1910). The Book of Arran. Arran society of Glasgow. p. 11. ^ Scott, Archibald Black (1918). The Pictish Nation, its People & its Church. Edinburgh/London: T. N. Foulis. p. 408. OCLC 4785362. ^ "Primary History, Vikings: Who were the Vikings". BBC. Retrieved 19 January 2017. The name 'Viking' comes from a language called 'Old Norse' and means 'a pirate raid'. People who went off raiding in ships were said to be 'going Viking'. ^ "Scandinavia". Dictionary.com. Retrieved 19 January 2017. ^ "About Nordic co-operation". Nordic Council of Ministers & Nordic Council. Archived from the original on 26 March 2014. Retrieved 25 March 2014. Denmark, Finland, Iceland, Norway, Sweden and the Faroe Islands, Greenland and Åland work together in the official Nordic co-operation. Wikimedia Commons has media related to Category:Norse history and culture.